Free EPIC Bar, any variety (1.3-1.5 oz.) in Kroger stores, with coupon. This Kroger Free Friday Coupon is available for download on Friday, January 26, 2018 but you have until February 11, 2018 to redeem it. What is EPIC Bar? 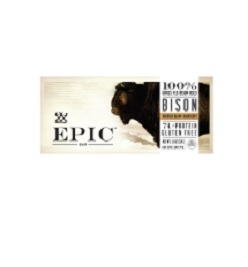 EPIC Bar are 100% grass fed animal based protein bars designed as nature intended. Paleo, gluten free, and low in sugar, EPIC bars promote EPIC health. Ingredients: they are sourced exclusively from ranchers and farmers. The beef and bison are both 100% grass-fed and organic. The varieties are: bison, beef, chicken, bacon, salmon, venison. Redeem your coupon in-store within 2 weeks for free EPIC Bar, any variety (1.3-1.5 oz.). Your coupon will automatically be applied at checkout when you use your Shopper’s Card. Available in most stores.